It’s Week One of the Fall One Room Challenge, and I’m throwing my hat in with all of my plans for a kitchen makeover! Hey friends! Eeek, I am so excited! Because today marks the first day of the Fall One Room Challenge, and I am joining this challenge for the fourth time. I will be making over my kitchen this time, and each Thursday for the next 6 weeks I will be posting about my progress and plans for this kitchen makeover. 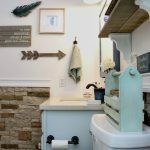 You may or may not have seen my previous three ORC makeovers, and if not you can click through to see my guest/kids bathroom makeover that I completed, my downstairs bathroom makeover that I completed, and my boys bedroom makeover. If you have not heard of the One Room Challenge (also called ORC), currently in its 14th season, is a widely anticipated biannual event every April and October. Each round, twenty design bloggers take the challenge and transform a space. It is hosted by Linda from Calling It Home and Better Homes and Gardens. 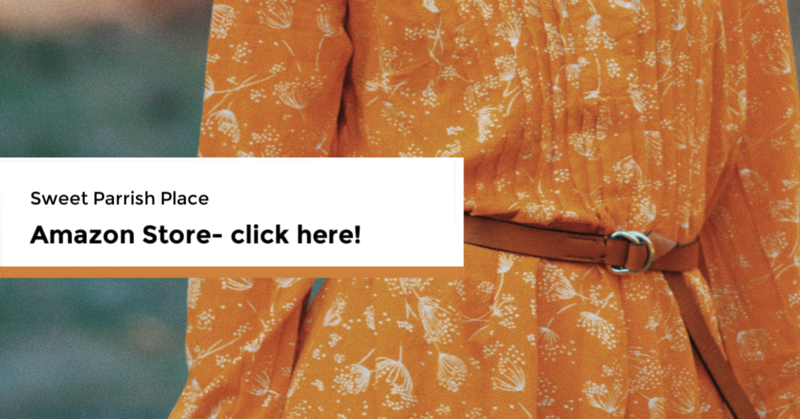 Wednesdays is the day for the design bloggers to go live with their progress, and Thursdays is the day for all the guest participants to go live. You guys will be amazed at these reveals, they are just beyond words good! I am so excited for this kitchen renovation, and in the spirit of honesty, I have already started on it this past Spring when we got new quartz countertops. It was at that point, that I decided to save this room to share for the ORC. So let’s start by going way back and let me show you what this kitchen looked like when we moved into the house. 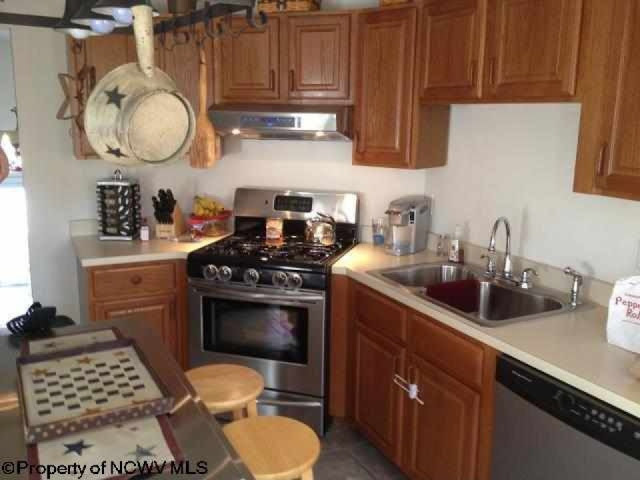 The next two photos are from the MLS listing, and honestly, they are really bad photos, I can’t believe that some real estate companies put out photos this bad. But this is where our kitchen started. Standard oak cabinets and formica countertops. 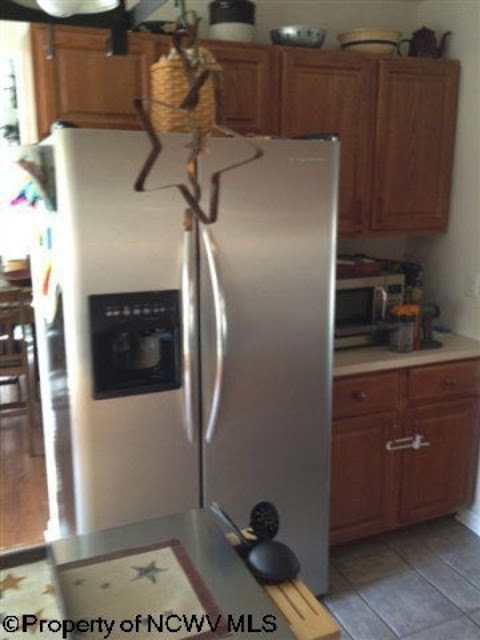 The appliances had been updated to stainless steel at some point, and I believe the previous owners installed the ceramic tile flooring, which I like just fine, and will be keeping. I am not a fan of oak cabinetry, at least not with this orange-ish stain on it, and I started planning a kitchen update right away after we claimed ownership of this house. Which coincidentally, is around the time I started this blog. So the kitchen makeover I did back then was one of the first projects I had blogged about. I set out to paint the kitchen cabinets, and I chose this buttery yellow. You can read all about me painting my cabinets here. This is literally from 2012 and one of the first projects I did in this home. The next five photos will give you an idea of the layout of this kitchen. For this makeover, we are not doing a gut job, and we are not knocking down walls. This is going to be a budget friendly makeover, and my goal is to share just how much you can update and change a space on a budget, and without a full gut job. Some elbow grease really can go a long way! And truth be told, this is not our forever home, and in actuality, our years in this house are numbered. We probably won’t be here for much longer, so we did not want to invest too much more into it. Our main goal at this point is for this house to feel fresh and updated for resale. Not to make it our dream home. We have some money to spend on really important things that need replaced, like a roof. And that is much more of a necessity than anything else. If you are scrolling through these photos and wondering why I chose this yellow to paint my kitchen cabinets, just know that I am too! I have always, my entire life, wanted a white kitchen, and it is completely beyond me why I didn’t just paint them white to begin with. Major brain fart? I think so! However, they did help to brighten up this space, and I did like them for a spell, that is, until they began chipping around the cabinet pulls. I used a Rustoleum Cabinet Transformations kit to paint these, and this yellow is just one of the color choices they had at the time. I would not recommend using this kit to paint your cabinets. Because once they started chipping, there was just no salvaging them. We lived with the chippy paint around most of the pulls for years and I never could fix it to look perfect again. This is because there was an antiquing glaze over them, which made it impossible to touch up. And can we just spend two seconds talking about the pot rack hanging light fixture over the island? Major hate for that thing. In some other kitchen, it may have worked and looked great. 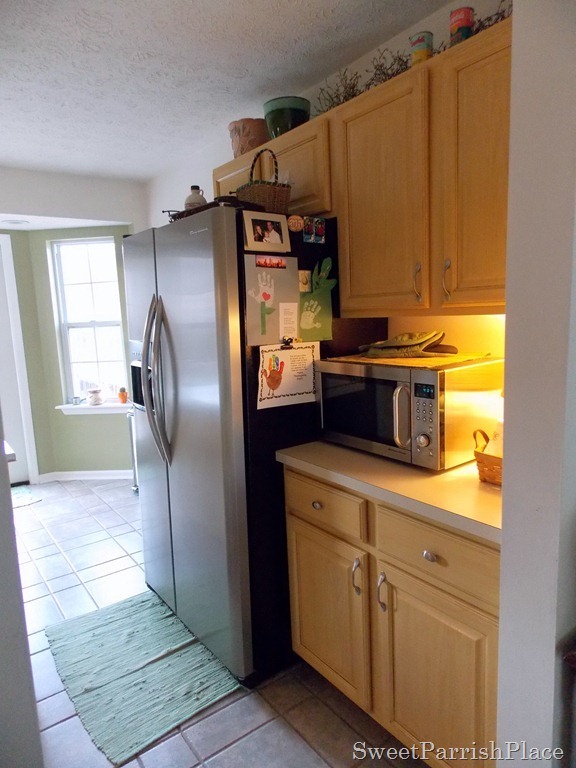 But my kitchen is on the small-ish side, and that thing takes up a significant amount of visual space. It HAS TO GO! 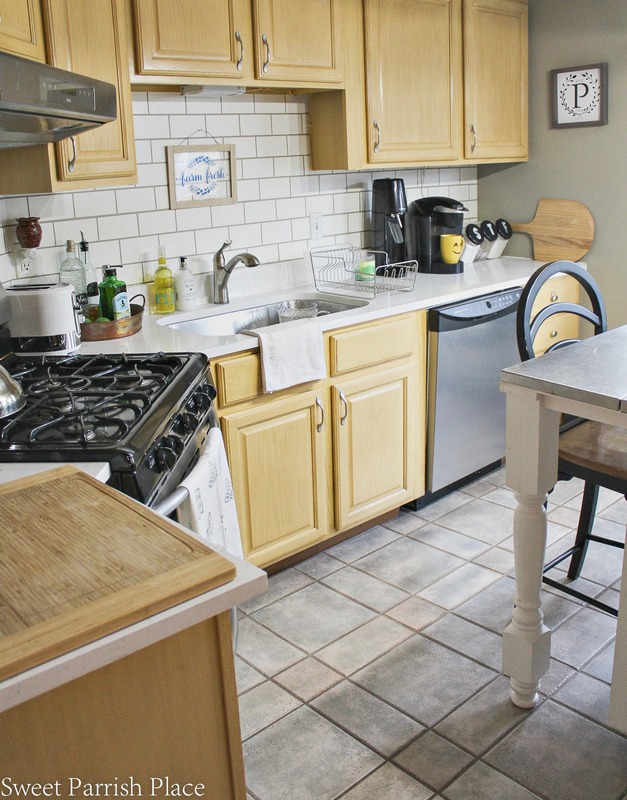 My next big project in this kitchen was the DIY faux subway tile backsplash. I completed this project, with lots of help from my husband, in 2013. You can read the full tutorial here if you are looking to do these yourself. This is one of my favorite projects to date, and it got me featured on lots of websites. 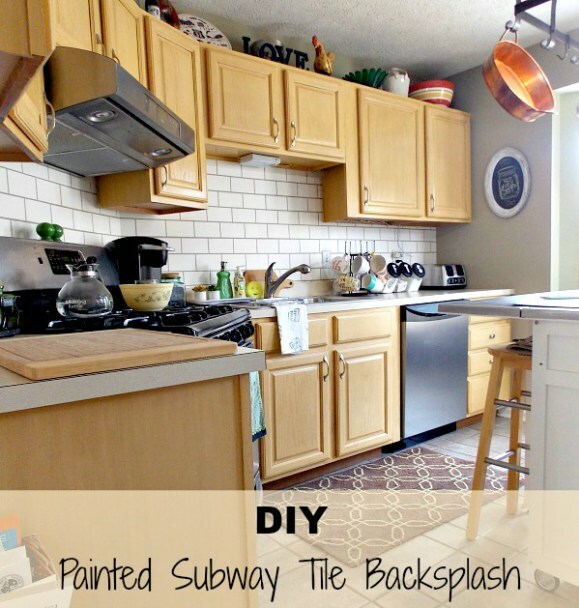 Remodelaholic actually did a full blog post feature on my faux subway tile backsplash. I was soooo excited for that! I thought I had hit the big time. I was wrong, ha! But it was very exciting and the most exposure my little blog had ever had at the time. And I am happy to report that this backsplash has stood the test of time. It still looks like brand new, and it isn’t going anywhere for this makeover. I still like it a lot, people who are actually standing in my kitchen think it is real. And my next door neighbor, who is a professional painter, thinks it is the bomb dot com. Enough said. I just don’t feel the need to spend money on installing a real tile backsplash because I truly like this one so much. I’ll save my money for my next kitchen in my next home, which will probably get a really nice tile backsplash. By the point of this photo below, I had also painted the walls in the kitchen. I never did like them though, I thought they were too dark from the minute I finished painting them, but I was not about to paint them all over again at that moment. I had bigger fish to fry. My goal when we moved here was to get every room in the house painted before I started going and repainting things. 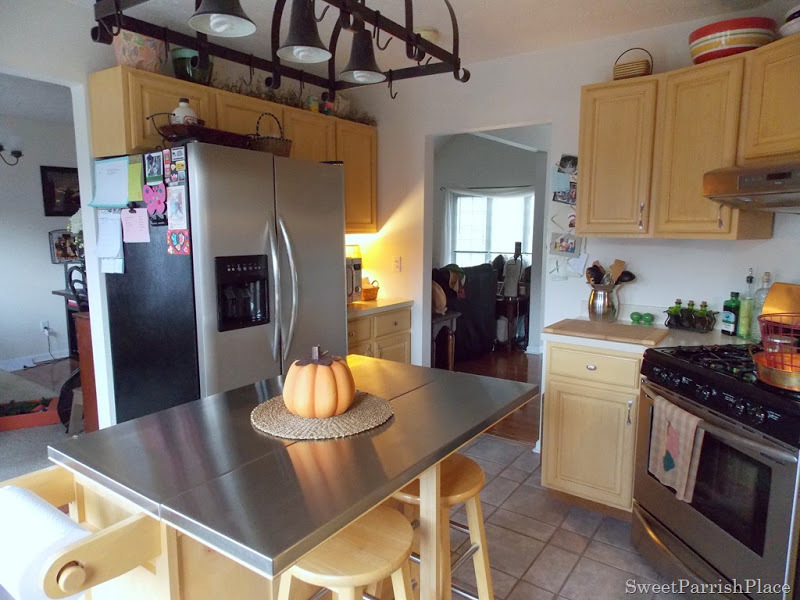 Next up, I turned my focus to the existing kitchen island that was here when we moved in. I wanted to give it an update. So I started by painting it white back in 2015. 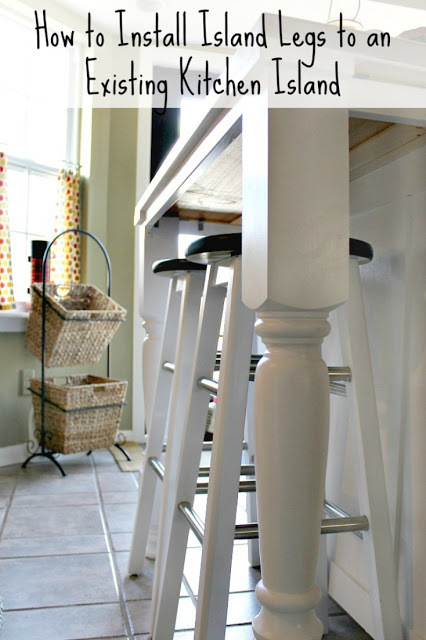 And then about a year later, I added these farmhouse style legs to it, which gave it a completely different look. I also gave the barstools a little makeover with some paint. 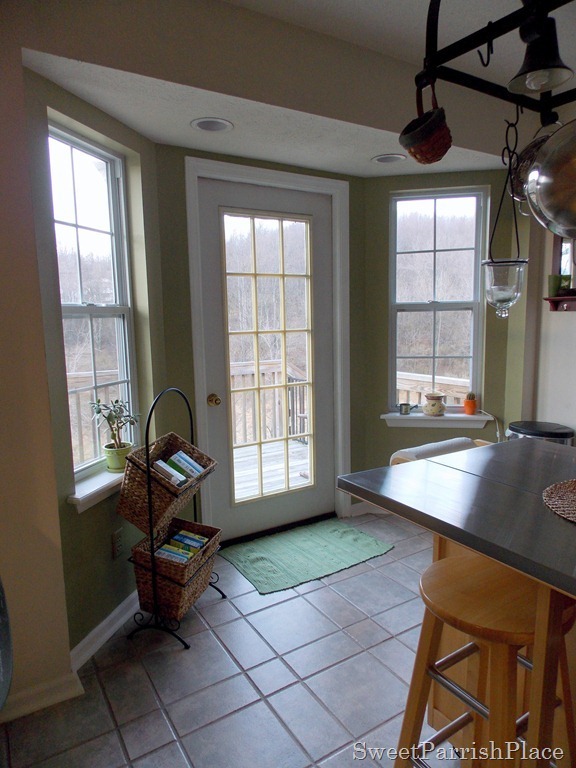 Some other projects I completed in this space at the time, which you can see a peek of in the photo above, was to make some DIY no sew cafe curtains for the windows, and to paint the kitchen door black. I sure did love that kitchen door, but unfortunately it had seen better days and we had to replace it. I searched for a door just like it that was in our budget, but couldn’t find one. And then, we decided to install a door that had a doggie door so that our dog can go out on the back deck. So it all worked out. You will be seeing the new back door in future weeks on the ORC, and I painted it recently. Can you guess what color I went with? 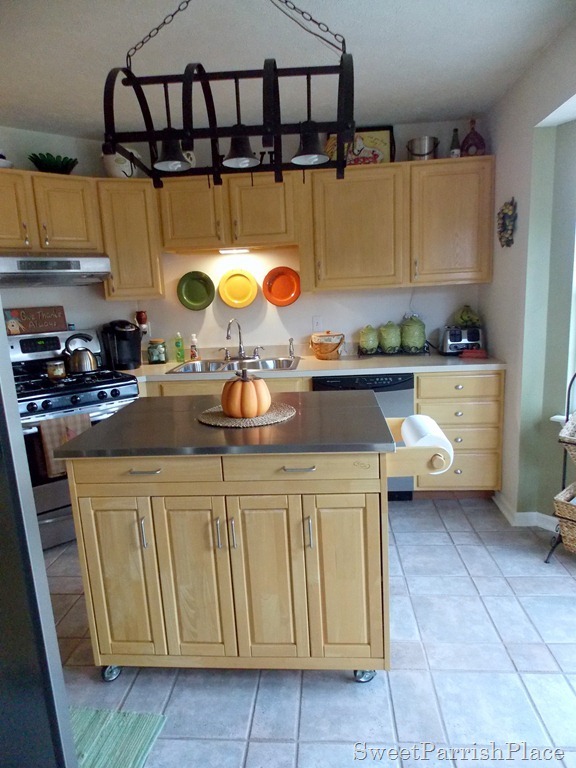 In April of this year, we actually began this second kitchen makeover when we had new quartz counters installed. We also got a new sink and faucet at the same time we got the new counters. We had started planning this makeover, and after this point, I decided to stop blogging about it, and share it for the Fall ORC. I am kind of regretting the faucet choice, but it is what it is. It may change one day, but probably not for this makeover. I doubt I am going to talk my husband into replacing a brand new faucet. What do you think? My only hope is to have a faucet company give me a new one for free, but I haven’t actually asked. I may approach some brands at some point, but have not done so yet. Lets just talk counters for one minute. I LOVE these quartz counters! I mean major love! They are pretty much dreamy! The only thing I can imagine liking better is marble, and that isn’t going to happen. So I am quite satisfied with this choice. You can see lots more photos of them here. We really love the new sink! it is just one big sink, and it is huge! 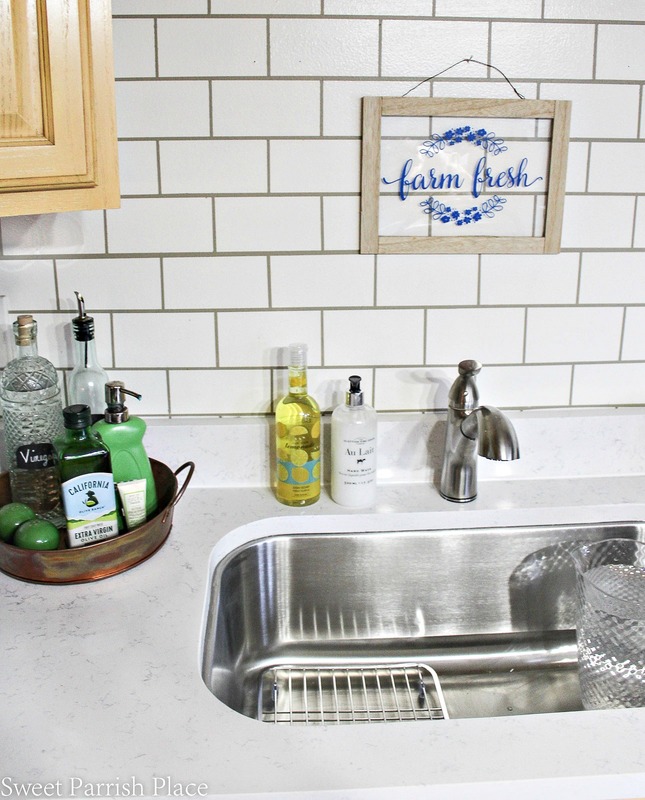 I would love a farmhouse sink, but that would require new cabinets, so maybe I’ll have one in my next home one day. Who knows? So, that pretty much catches you up to speed with the kitchen over the years since we moved in. 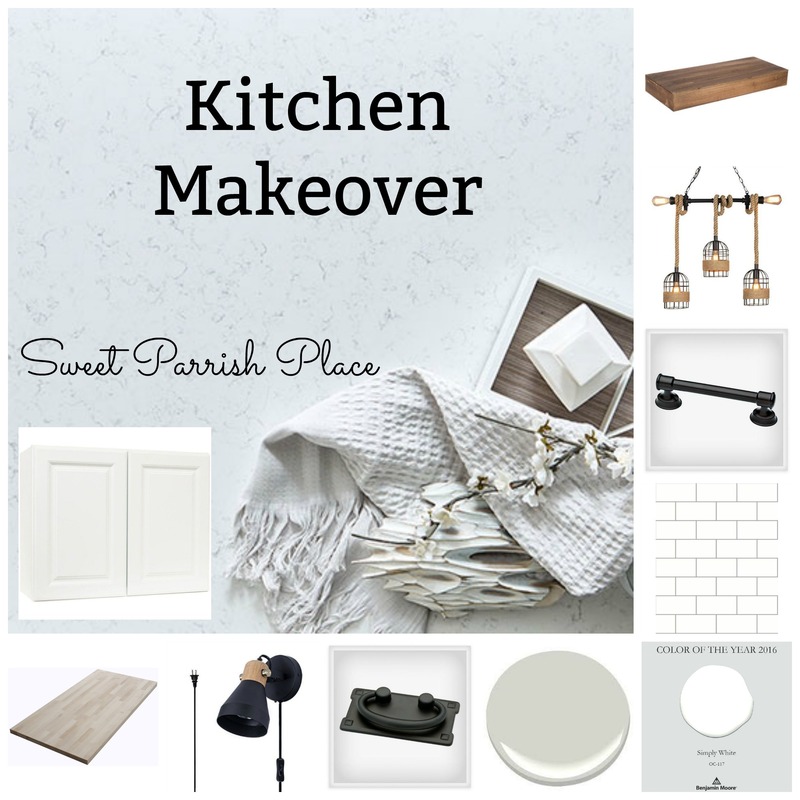 Now, it’s time for me to share my plans for the kitchen makeover. I’m going to start by sharing the inspiration board that you saw at the top of the post, just so you don’t have to scroll back up over and over, you are welcome. And then I am going to share a list of things that we plan to complete for this kitchen makeover. So there you have it friends! I will be back here every Thursday for the next 6 weeks to share our kitchen makeover progress, and the big reveal is scheduled for November 8th. I hope you will come back each week and follow along! And don’t forget to go to the One Room Challenge Page too, where you will find lots of other bloggers who have linked up their room makeovers. Before I go, I wanted to mention that I am an Amazon Influencer, and I now have a storefront that is up and running! You can click here to go to my page. You will find this smart lock there, along with loads of other things that myself and my family have ordered and love. I have all sorts of different things linked there, including things that I have already ordered myself and things that are currently on my wish list. I love your kitchen plans! The white is going to feel so bright. Looking forward to following along! It’s going to be a welcome change for sure. Thank you! It’s going to look so nice and bright in here! That is definitely the goal! This is really going to make such a difference in your kitchen and change the entire feel of your home. I know you have got to be excited about that! I definitely am, for sure. Thanks so much! I’m always so impressed by people who take on a kitchen for the one room challenge! Love your plans! Looking forward to seeing it come together! It is a daunting task for sure. We were able to get a head start on it before the challenge began, and we think we are on track to have it finished in time! Thanks! I love your inspiration photos! We had a pot-rack in one of our homes, and I loved it but agree, it does take up “space”…it feels more open without it! We had one in a previous home that I loved, but this one in this small kitchen, no no no! Haha! Nicki! 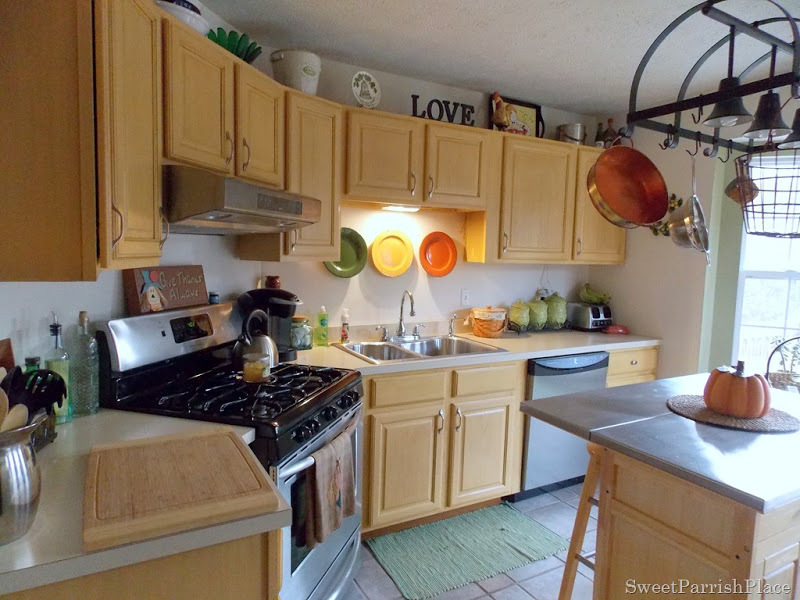 I cannot wait to see what amazing things you do with this kitchen! We almost chose our kitchen for this fall’s ORC, but we changed our minds at the last minute. I will definitely be following along to see how it unfolds each week! I admire your fearlessness is opting to do a kitchen! Its going to be gorgeous, can’t wait to see the finished space. I love your plans! This is going to be such a stunning transformation. All the best and good luck to you! I love all of the choices on your design plan! Can’t wait to see this space! I can’t wait to see this come together! What paint would you advise to use for kitchen cabinets?